How busy are your best customers? Pretty busy right? They can afford a nice bike because they have successful careers, and they probably have a family too. Do you remember when these customers would just pop into your bike shop to see if you had what they were looking for? If you didn’t have it they’d let you look through a catalog and place a special order for them. That doesn’t happen as much as it used to, does it? Your business isn’t alone. All types of retail are being transformed by the frenzied schedules and convenience obsession of shoppers. What if your customer could go onto your store’s website, make a purchase and chose “pick up in store”? On the way home from work, they could swing by your shop and their purchase is waiting for them. Fast, convenient, and no shipping charges. If you’re not yet familiar, “click and collect” is a purchasing option that is changing the way consumers shop with retailers. According to a recent study by Nielson, four out of 10 shoppers in the U.S. are using click and collect – a number that’s expected to rise. You see it everywhere. You see businesses like grocery and hardware stores investing in technology to make this easy, and marketing to attract new customers. So, where does this leave bicycle shops? Is it possible to offer this feature and, more importantly, is it worth it? In fact, the easiest way for a bike shop to offer online buying is through a click and collect strategy. SmartEtailing websites automate catalog content, inventory availability, and pricing updates. You can easily configure a local website and set your in store pickup options. A recent survey in Bicycle Retailer and Industry News, which polled over a thousand bike shop owners, cited several reasons for stores not incorporating ecommerce into their business model, the biggest being logistics. The poll revealed an interesting fact, retailers not yet selling online view competition as a much bigger factor than retailers that do sell online. Did you catch that? Shops that DO sell online don’t see competition in the same light as retailers who DON’T have an online store. What role does fear of the unknown play in this perception? The truth is, click and collect reduces barrier of entry and complexity. It’s the ideal option for shop owners who don’t want to ship products but want to offer their local customers more convenience. Click and collect enables interested shoppers to do their research online, pay for the items they want and head to the shop to pick them up. And since 62% of customers purchase additional items at the time of in-store pickup, the opportunity for additional revenue from add on sales is greatly increased. Brick and mortar sales still account for 90% of all retail sales. Why? Because shoppers still prefer the ability to see and touch items. At the same time, today’s consumers demand convenience and savings. They value online reviews and conduct research before heading to the store. This is where click and collect can produce value, because it combines the best of ecommerce and traditional retail. By adopting a click and collect strategy, you will enable your customers to shop however they prefer, which will go a long way toward loyalty and retention. 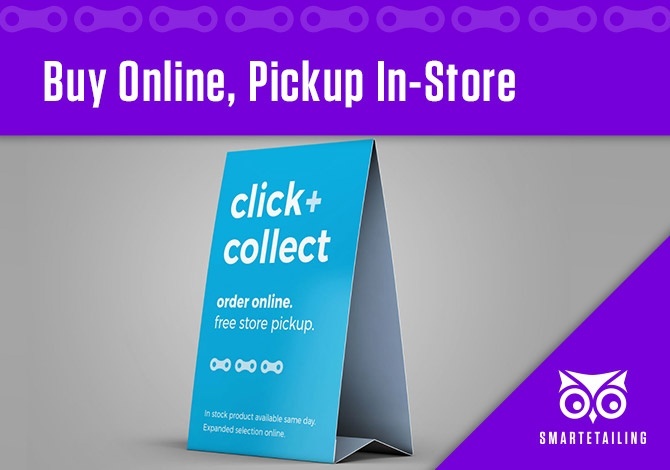 As mentioned, one of the nicest perks of offering click and collect is the fact that the majority of consumers who take advantage of the option will ultimately leave your store with more than they originally planned to purchase. Think about it. A customer goes online, orders a new bike in-store pick up. When she arrives, your sales person greets her, goes over any instructions, answers her questions and then makes a recommendation for a nice accessory. In other words, click and collect is a great way to not only close the deal, but also provide opportunity to upsell and increase revenue. Is the owner of the bike shop across town one of the 38.5% of bicycle retailers that don’t sell online? If so, you have the distinct advantage of getting a leg up on your local competition. We’ve already discussed how the vast majority of consumers go online before making an offline purchase. If your website is front and center when they do a Google search for local bike shops but your competitor’s is not, where do you think that prospect is going to end up? Still not convinced? According to research we conducted, in 2017 online sales across all SmartEtailing clients saw double digit growth, outpacing growth in most physical stores and certainly the overall market. Simply put, click and collect aligns perfectly with local businesses that want to serve local consumers and see them face to face, but still want to offer the convenience of online shopping. What’s more, it offers the easiest next step for bike shops looking to participate in the explosive growth of the online sales market. Not sure how to get started? That’s what we’re here for. Get in touch today and let’s discuss how we can help bring your bike shop website to the next level.